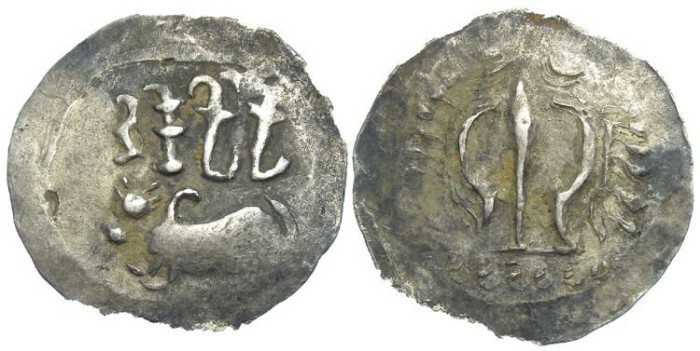 Denomination : Silver unit, with a weight that suggests a denomination of 64 rattis. Date : I think the dating of these is by no means certain, but in general most references would place this in the mid 8th to mid 9th century AD. Reference : I have not found a exact reference for this one, but it came to me with a reference to M (SEA) 218-221 (and a date of 9th to 10th century AD). Size : 28.1 x 30.0 mm. Weight : 6.66 grams but was probably just over 7 grams when minted. Grade : Fine, but the coin is highly crystalline and the edges have crumbled a little just above and below the obverse. Obverse : Bull with a inscription above that names Harikela. The style of the caligraphy is crude, probably placing this coin late in the series. Reverse : Very stylized trident with dots around.